. more things for sale here (ran outta room) :: https://raneairrepairs.webs.com/ oct-2018. - pd.
. A LITTLE ABOUT MYSELF AND THE LOWER PRICED, POST 2007 WEBLEY AIR RIFLES : during a childhood of hunting, fishing, and trapping - i used sevaral crosman, daisy, sheridan, and benjamin airguns. some were co2. some were 'pump-ups'. some were spring powered bb guns. when i reached adolescence, i crossed paths w/ an RWS (diana) model 45. 1984. things were never the same after that. mid-1984. i sacked groceries all summer long and ordered an RWS (diana) model 36 - but before that, my folks made me attend a hunter's safety course (now required for hunting liscence for those born after sept. 1971 - here in texas). it was a three way tie between a BSA supersport, a beeman R1, and a model 34, 36, or 38. i believe they were about the first 'magnum' springers - shooting around 1000 fps. since money was such a large factor when i was 15, i chose the model 36 made by dianawerks. i ordered it from a cabela's catalog for $129. i think bass pro shop was someone's garage then. the first few times i shot it, i had a pellet richocet off the gravel around my target. that sound. it sounded like a .22 rimfire richocet. i've been hooked every since then. i began to return to one of my first loves (airgunning) about a year ago (spring-2009). a lot has changed. breaking the sound barrier. pre-charged pnuematics. adult airguns from areas other than europe. daisy and crosman selling adult airguns. robert beeman once estimated that those of us who seek and enjoy high quality, high velocity, and highly accurate, airguns actually make up about 5% of the total airgun / bb gun / pellet gun population in america. many cannot comprehend spending over $200 for a pellet gun. they were only exposed to the american plastic and bb ideology. i run into to people all the time at the local retail sporting goods areas, looking at the 'bb' guns. the other 95% just plain doesn't know about the finer side of airguns. i'll hand them my business card and begin to educate them. most are quite suprised and some are even excited. this website is a direct result of that type excitement. ..... and when i find good deals, i'm excited to share them w/ the rest of the airgun community. fall 2013 - in addition to tuning and repairing uk webley airguns (or 'noble' webleys), i am in the process of re-working and tuning the now available webley tomahawk quattro air rifles (tomahawk II), the quattro stingrays, webley valuemax variations, and quattro patriots. 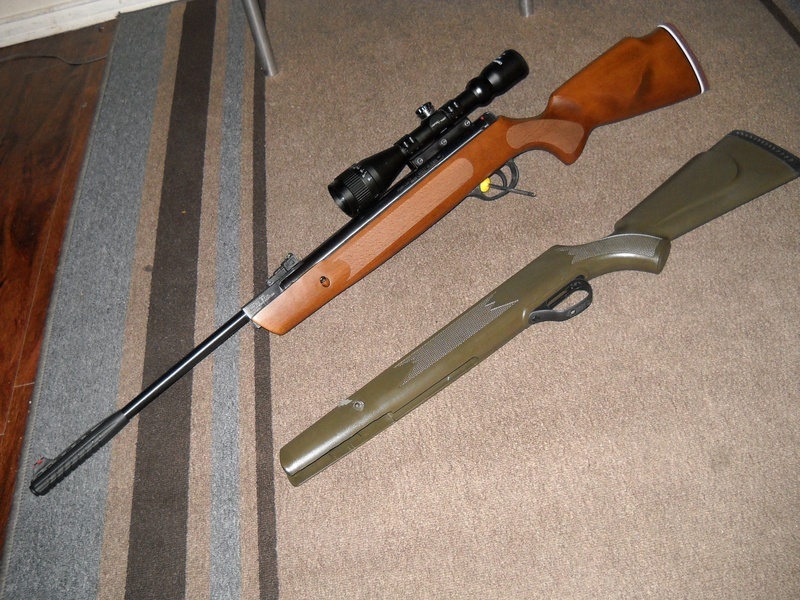 i am also servicing and tuning the now largely available line of hatsan air rifles. where i once was able to make post 2007 webley spring / piston air rifles available to others at a very good price, i am no longer able to do so - the storehouse ran empty. but that all started when i ordered a .177 tomahawk and was so astonished by the deal, that i arranged to offer the bargain to everyone else. i'm also able to find good deals on all types of used airguns. the webleys were available in calibers listed. ( ....... i left the rest of this text as it were for those who may need information based on my personal experience with webley's first attempt to market to united states after their move from england to turkey..........) there were four models to choose from : the jaguar is the economy gun w/ all-weather polymer stock. 750-800 fps in .22 cal. $95 delivers one to you. the stingray has a l.walther barrel and shoots almost 840 fps in .177 and over 630 fps in .22 cal. (the manufacturer rates it at 800 fps in .177 and 600 fps in .22, but i've found them to be more powerful than that). comes with a dark walnut stock. $175 delivers one to you. the longbow also comes with a lothar walther barrel and shoots 760-800 fps in .177, 600 fps in .22. classic 'venom' beech stock. $185 delivers that to you. and the tomahawk - it's like a longbow on steroids. classic 'venom' beech stock. it shoots 940-1000 fps in .177. $195 delivers this one to you. both longbow and tomahawk come ready for scope to be mounted, having no open sights, but rather a well-crafted muzzlebreak. contact me if you have any questions, or if you are looking for something else. - paul d self.
. these are the tried and true older design . very safe, lightweight, and compact. ultra adjustable for most any spring piston or gas ram / gas spring rifle or pistol. the $220 price includes fed ex ground insured shipping within the lower 48 states of america. raneman. 6-23-2016. ... become a member of this website and receive this item at an unadvertised discount. just email me. ... . . . ..
.. a tale of two .20's ..
. as a huge fan and advocate for 5mm airguns, i feel saddened by the way the industry appears to phasing .20 caliber out. sheridan production ceased 2-3 years ago. the .20 cal pellet section of pyramyd air now has only eight selections. and when webley indicated they had no plans for more .20 valuemax rifles, i crumbled. i then ordered 2 cases (six vmx rifles), and i ordered the last of welch willie 2 triggers from wales, england. they sat in the shop for year. this is the last of the crew. just recieved and installed the wooden striker 1000 stock today . gun $150, ww2 trigger is much the same as a gtr/gtx gold colored aftermarket trigger and $40. the stock shipped was $55. gun shoots an average of 820 fps with 11.42 grain h&n ftt pellets (same as beeman fts pellets), which is 17ftlbs. i lube-tuned it, but it really didnt need it. it is worth buying one of these 5mm/.20 caliber webley vmx break barrels. only 6.4 lbs in stock form with the plastic stock shown. it is by far the cheapest way to get into .20 caliber now days. this .20 beeman r9 goldfinger with vortek pg2 kit (purchased from john yarborough who did an excellent, if not perfect job on this air rifle) was used for comparison. both are almost identical over chronograph, and in weight and size. both are just as accurate, but rekord trigger better and beeman looks better......however, it would be hard for me to drag the $550 r9 through the texas thorny brush to pop small game....the $250 vmx also shown will be much easier on my worries as i creep through briar patches and mesquite trees. all that to say this : get one of these .20 webley valuemax air rifles while you can. they tune up and clean up nicely. .
. i regularly post video reviews of various airguns on youtube . search " rane air " then click on 'channel' box .
. i am publishing a new website - seen here : https://raneairrepairs.webs.com/ ... please contact me to discuss your airgun needs by phone or email . 817-798-4598. [email protected] . .177 diana p5 mag - as new - $150 shipped.